A beautiful bathroom can be the most relaxing room in the house. After a long day, what’s better than taking a soak in the bathtub or a nice long shower? Choosing the right colours to use in your bathroom can play a part in how relaxing the space is. Although most modern bathrooms will use neutral shades, colour can help to add personality and warmth to your bathroom. Whether you’re going to add colour through accessories or through fixtures and fittings, you should consider the benefits that a splash of colour in your bathroom could bring. Add colour to your walls with colourful wall panels or painted walls. 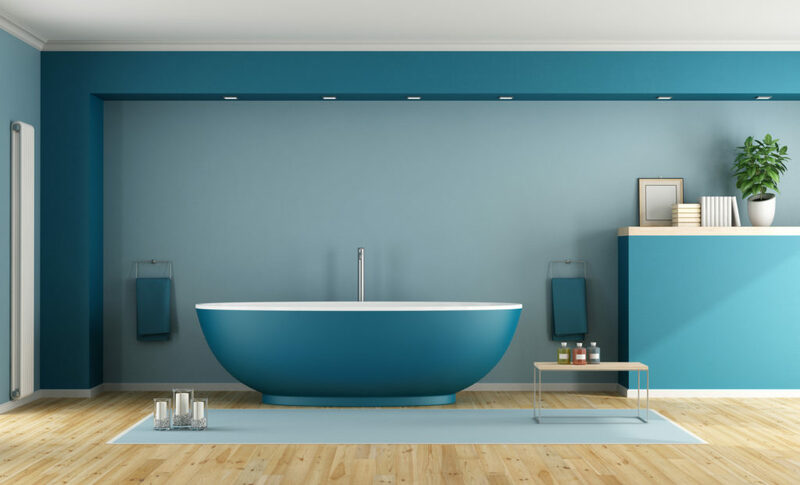 If you’re not keen on your whole bathroom being decorated in a bold colour, make use of accent walls in specific areas of the bathroom, around the bath, shower or sink area, to highlight your favourite feature. Contrary to popular belief, coloured walls can look great in any size bathroom if you have the correct lighting. Dark grey, blue or green walls would look equally as stunning in a small room as they would in a large bathroom, if done right. Just be sure to consider installing a mirror to reflect light as much as possible if you opt for a dark colour. Scandinavian style bathrooms are here to stay and are a timeless way to update your home. The Scandinavian style involves neutral colours like grey, beige, or white mixed with accentuating splashes of colour – it is one of the most popular modern bathroom colour schemes. In more traditional homes, darker colours can also look great – particularly dark green or blue. Mixing these colours with wall panels in a more subdued tone can create a beautiful contrast, and they both complement chrome, gold or copper fittings. If you’re in doubt about which modern bathroom colour scheme is right for you, you can always fall back on a simple white bathroom suite. This timeless choice will always look clean and fresh if it’s well kept, and it’s unlikely to go out of style. Although coloured bathroom suites are creeping back into fashion, they’re still not to everybody’s taste. White bathroom suites are the go-to around the world, and for good reason. Their clean and fresh look is perfect for bathrooms. 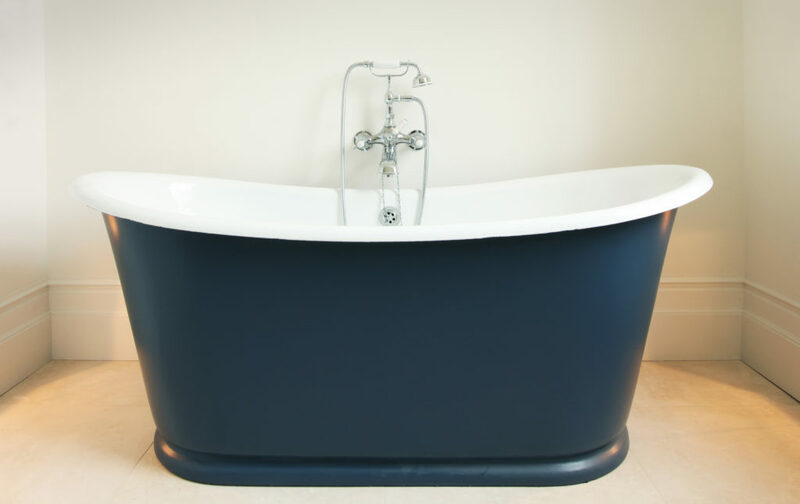 However, you can create interesting colour contrasts in a modern way by updating roll top baths and painting the outward facing side in a bright or complementary colour. You can also paint your skirting boards or bathroom cabinet and consider coloured bathroom hardware like matt finish taps and shower heads. Matt finish hardware especially, is building in popularity and can prove to be a little more interesting visually than simply having coloured walls. If redecorating isn’t an option in your bathroom, you can always use the accessories within to change the colour scheme. Choosing coloured blinds, towels, toothbrush holders, soap dishes, and more can add little colourful details that make your bathroom much more interesting. Even plants are a great accessory for the bathroom and add a splash of natural colour to the room – along with also providing the added benefit of cleaning the air. Make sure to choose a plant that thrives in a humid atmosphere, such as a type of ivy or a succulent. Coloured lighting is a great way to add ambience to a room. If you’re refitting your bathroom completely, consider installing coloured lighting in your shower space. Coloured lighting also looks great recessed into ceilings, shelves or even along the skirting at the bottom of the wall. This is a perfect way to add to a modern bathroom and make it a more personal space that’s suited to you.